I used the the same method as the Top Down Round Yoke Cardigan Tutorial (see sidebar), but choose the cropped option for body length, and just worked one row of double crochet (= US single crochet) for the sleeves. Looks really pretty! I love that green and rose colors together. Rowan has some very nice yarns. Oh Lord, both the sweater and your daughter are so cute! Adorable girl. The cardi is sweet on her. I may make one for my 4 year old out of cotton this summer. Brilliant. Thanks. 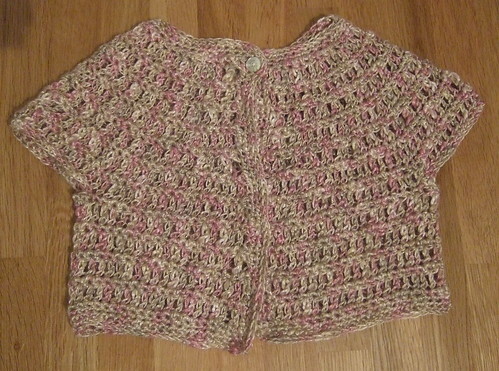 Pretty cardi for a pretty girl. This used to be my favourite pattern when my daughters were babies. I have done so many that I can still make one without looking at the pattern or wondering if it will fit or not.I had done one I remember particularly was done with two strands held together.One pastel colour and the other white.With edging done in one colour. 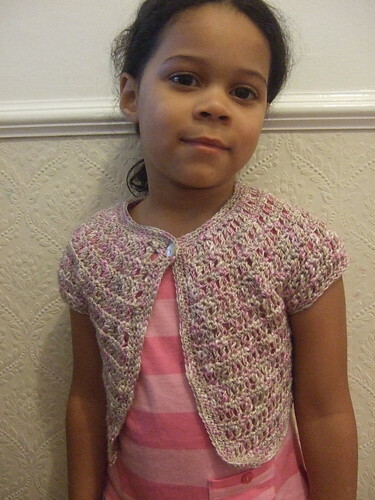 Where can I get a printed pattern for this gorgeous cardigan? I don’t have the software that you mention.